If you’re like us, what intrigues you the most about football betting is the prospect of earning easy money, and the limitless possibilities of in-play betting markets offered by sportsbooks is a way to make some serious dough. With many options at your fingertips such as betting challenges, how do you determine what in-play bet is right for you? The goal of any bettor should be to get the most value from each bet, and with ever-evolving markets and incredibly smart bookmakers, that may often seem like a tall task. A tried and tested approach is to cut down on the number of markets, and focus on a narrow niche or league that you could excel in. Believe it or not, statistically, the markets offering the best odds are none other than in-play bets. This is because traders don’t have time to set their prices based on days or weeks of research, like they do with pre-match markets. If you’re quick with your wits, your edge will become extremely profitable. But there are hundreds of in-play markets to bet on, how do you choose the best bet? Worry not! 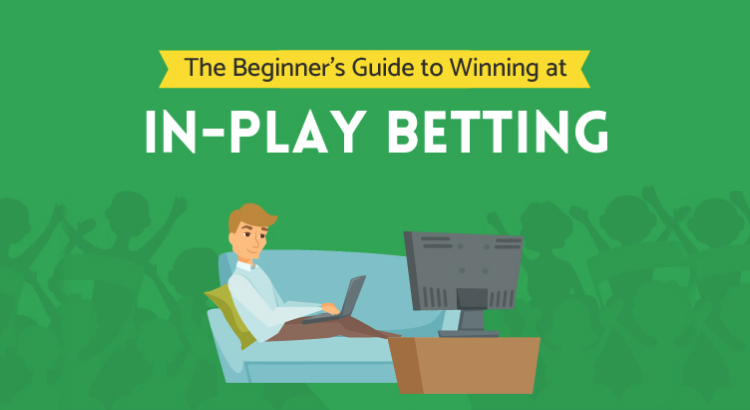 We’re here to guide you through the ins and outs with this definitive in-play betting tips guide and provide you with tips, secrets, and strategies to help you rise to the top. We’ve put together this infographic that we’re happy for you to share. Alternatively, if you’d prefer a written guide over a visual one, you can scroll down. It’s much easier to beat a bookmaker in-play rather than on pre-match markets. Because traders are intelligent people who are highly skilled at pricing up odds in advance. However, it’s much easier for them to make mistakes when covering hundreds of games in-play that are rapidly changing – and we can take advantage of that. If you’re a beginner or novice in-play bettor, or you simply want to improve your live betting skills, then this guide will help transform you into a powerhouse that the bookies will learn to hate! The size of each bet you place – or your stake – should be relative to the size of your betting bankroll. Your betting bankroll is the amount of money you have assigned to sports bets – and you should only bet what you can afford to lose. To put it simply, the more value you believe to be in a bet, the bigger your stake should be. Even when you think there is value in a bet, you should protect your bankroll at all costs and look to grow it slowly.